This is a scrumptious way to use the very versatile Mango. This Bundt cake is sweet, rich and delicious. It is as easy to make as it is to eat. Anyway the idea for this months Bundtbaker come from no other than Lauren Mitchell From Gate to Plate. She picked a great challenging theme that brought me a bit out of my comfort zone. spray your bundt pan liberally with cooking spray. Set aside. Sift the flour, baking powder and salt in a large bowl. In an electric mixer fitted with a paddle attachment beat the butter and sugar until light and fluffy. Add the eggs and vanilla and beat another minute or so. In batches add the flour mixture, alternating with the buttermilk and ending with the flour mixture. Pour the batter into the prepared bundt pan and bake until the cake is golden and a cake tester comes out clean. About 45-50 minutes. Invert the cake onto your platter. Combine the mango, water and sugar in a food processor. Blend until smooth and thick, taste to adjust sweetness.I also pushed the mixture through a mesh sieve to make as smooth as possible. Spoon the mango topping evenly over the top of the cake. 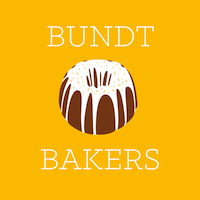 Our lovely group, Bundt Bakers, just keeps growing. It’s awesome! There are so many bundts for any tropical fruit loving person! Be sure to hop on over and check them out. Totally drool worthy! Beautiful cake. I love the color of the glaze. I’m sure it tastes just as good as it looks. Wow! What pretty photos. This cake looks delicious. I love the use of buttermilk in the recipe, it makes everything taste soooo good! Love mango anything — this sounds delicious! This cake sounds delicious! I love the flavor of mangos! I love the mango glaze, that is awesome. It is great that some of us can pick the same fruit and are bundts are still so different, I sure wish I had a slice of yours!! Yum, I like the sound of this cake. And it’s simple to make! Looks delicious, the photo’s are lovely. Even the colors of this cake take me to the islands! Great photos. Love that the glaze can be adapted for any fruit! What a fantastic idea for a cake. I think the only person who enjoys mango more than I do is my mother-in-law. I think Mexican Mango Cake is on the menu for her birthday this year! Love the glaze! Makes the cake even more beautiful. I agree with all your other admirers. The glaze makes it. Since mango is so delicious, I know this is one scrumptious cake. Next time I bake my mango Bundt I am adding your mango glaze, Vonnie! What a beautiful way to add the mango magic to a cake. Wow, amazing bundt cake! That glaze just has me wishing I could eat mangoes, but I know I will have to make this for my daughters. This looks so yummmmmy!!! It is mango ,another of my tropical faves!! Has anyone ever used this recipe to make cupcakes? If so, how did they turn out? Never mind. I saw it in the recipe. to prioritize digital trade issues in TiSA negotiations. Will try w/yellow cake mix buttermilk and will add purre’d mango in to the mix and adj liquids. Will also tweek glaze, want some fruit specks in glaze. Kinda like orange zest. Will serve w/3leches ice cream and mint garnish. Loved the cake! Super rich and moist! The mango sauce was eh… Next time I will make a lemon or strawberry glaze.